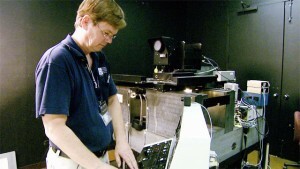 Dr. Michael Catelaz at work on the GAMMA II imaging machine, at the Pisgah Astronomical Research Institute (PARI) in North Carolina. Dr. Michael Castelaz, the Science Director at the Pisgah Astronomical Research Institute, knows GAMMA II is a sleeping giant. He just needs a little help waking up the beast. GAMMA II and its sister, GAMMA I, are legendary imaging machines that were used to create the 19-million strong Guide Star Catalogue for the Hubble Space Telescope (HST). Think of the Guide Star Catalogue as a souped-up GPS, enabling the Hubble to set its scope on stars thousands of miles away. Four years ago, the Space Telescope Science Institute at Johns Hopkins University announced it was retiring the image-makers after nearly 20 years of service. The news swept across the astronomy community and Castelaz and his colleagues at PARI jumped at the opportunity to bring the GAMMA machines to their Western North Carolina campus and reconfigure them for a new cataloging gig. “It’s old, but it’s still state of the art. It’s incredible what was done in terms of designing these instruments and getting them going,” Michael Castelaz. But why bring this beast to PARI? PARI houses a collection of old photographic plates known as the Astronomical Photographic Data Archive, or APDA. Those analog plates contain invaluable data of the night sky, but are not easy to share and use. Catelaz and ADPA director Thurburn Barker believe the re-commissioned GAMMA II can help convert those plates– some of which date back to the 1890s – into new digital maps for future astronomers. The maps will unlock data on thousands of unclassified stars known to exist in the APDA collection that can then be cataloged by their size, temperature and distance. — Dr. Michael Castelaz, re: the GAMMA II imaging machine. When PARI finally obtained the machines they were in pieces: three-tons of granite and lasers awaiting their next mission. The sheer mass of the machines was intended to absorb vibrations from the floor as well the Earth. In order to effectively serve the Hubble, GAMMA precisely mapped stars down to the exact micron. That’s a thousandth of a millimeter to you and me. Castelaz and his cohort eventually reassembled GAMMA II and got all the electronics up and running. However, do to the jerry-rigging and hand-written code used to reconfigure the original machine, they have not been able to recreate the imaging capacity … yet. As soon as PARI can get GAMMA humming, the APDA collection will no longer be a black hole. The meticulous work by generations of astronomers will be ushered into the 21st century, bringing analog data back to the future.